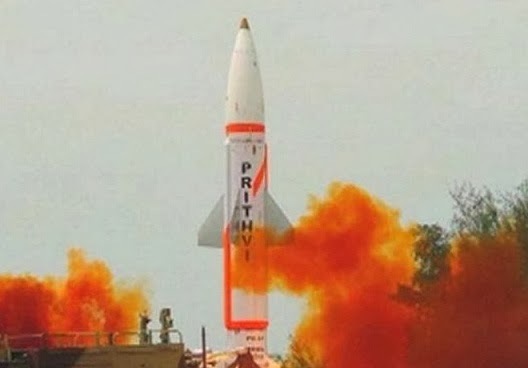 India successfully test-fired its indigenously developed nuclear-capable Prithvi-II missile, which has a strike range of 350 kms and is capable of carrying warheads of upto 1000 kgs, from a test range in Odisha. The launch was part of a user trial by the Army. Describing the trial of the sophisticated missile as a "complete success", Integrated Test Range Director M V K V Prasad said the launch conducted by the specially formed Strategic Forces Command (SFC) met all the parameters. The surface-to-surface missile was test fired from a mobile launcher in salvo mode from launch complex-3 of the ITR at Chandipur near here at about 0948 hrs. Inducted into India's SFC in 2003, Prithvi II, the first missile to be developed by DRDO under India's prestigious IGMDP (Integrated Guided Missile Development Program) is now a proven technology, a defence source said.